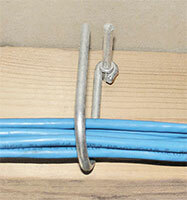 These 5/8" nail on Galvanized Drive Rings are used to support communications cables and other low voltage wires. drive rings with looped harness saves time and provides a very economical support in wet or dry locations. They may also be used on wood surfaces or with beam clamps that accept drive pins.